Come and meet our robots! 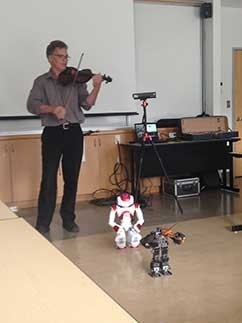 Having taught mechatronics, robotics and controls to mechanical engineering students over the past seventeen years, Dr. Robert Bauer, Assistant Dean, Planning and professor in Mechanical Engineering, has developed myriad robot teaching demonstrations which he enjoys sharing with others. Everyone is welcome to come and watch as Dr. Bauer demonstrates how programming is needed to enable Robots to perform various tasks. Some of the unique and interactive demonstrations include: Princess, a humanoid robot that interacts with people, plays the piano (on an iPAD), and demonstrates Tai chi, another humanoid robot that follows human arm motions via a Kinect for Xbox One sensor, and more! Please join us and come and meet the robots. You definitely won't want to miss this fun-filled presentation! Dalhousie's Faculty of Engineering has had many different names over its 100-year past, but one thing has remained the same: its extensive history of educating some of the best engineers in Canada. See what Dal Engineering faculty, students and staff have been up to in this week's Storify. Faculty of Engineering Dean Joshua Leon answers our questions in this video interview. The Faculty of Engineering officially joined the Dalhousie family on April 1, 1997 (no joke). Originally part of the Nova Scotia Technical College, which then became the Technical University of Nova Scotia, the Faculty has an extensive history of educating some of the best engineers in Canada. Since becoming part of Dalhousie, our Faculty has continued to grow, with a combined number of undergraduate and graduate students this year of approximately 2,300. Get to know some of the faces at the Faculty of Engineering. "I started working at Dalhousie in 1994 as a co-operative education student in the dielectrics and rheology food science lab. This led to research into impedance spectroscopy and a Masters in Applied Science detecting ischaemic or infarcted biological tissue. After working in industry for ten years, I returned to the iDLab in the Nova Scotia Product Design and Development Centre to develop products for local small to medium enterprises. Dalhousie has provided exceptional research opportunities. Currently, I am working on a Doctor in Philosophy in Electrical and Biomedical engineering, using high-intensity focused ultrasound as a non-invasive surgical tool to remove susceptible biological tissues." "I started at Dal (when it was TUNS) in 1982 as a graduate student, and I have been teaching in engineering since 1985. I enjoy teaching and doing research on many different types of scheduling problems: I have been involved with groups that looked at school bus scheduling, garbage pick-up, air crew scheduling, nurse scheduling, and the Access-A-Bus system. My longest running project will be 21 years old on October 1: an information system for seaport management that has been running continuously since 1994 (except for one really severe hurricane that took it down for a week). In the Faculty of Engineering, we are very happy to have a quickly expanding student population (more than 50 per cent in the last five years). As I meet with students, I am proud of the hard-working group that we are educating. About 70 per cent of our students do co-op work terms, and I am one of the employers: best employees you can hire! Our doors are open to any students who need help, and we are continuously improving our programs to support and educate the engineers of tomorrow." "I came to Dal in January 2011 to take up the NSERC Chair in Design Engineering. Starting a new job is always a little stressful, and moving across the country (I came to Dal from Calgary) amplifies that stress a little. In my first week at Dal, before I had keys to my office or an ID card, I decided to try out the gym on Sexton Campus. While I was at the gym a big snowstorm had started and the university closed. Of course, I didn't know that, and when I tried to get back to my office, I found all the doors locked. I had to walk around almost the entire campus outside in my gym clothes in a snowstorm and hope that someone would hear me knocking and let me in. That was certainly an early introduction to how the weather in Halifax can turn on a dime. My Chair is focused on increasing the design content in courses across the engineering curriculum. In an already full curriculum, this is not an easy task. One of the parts of my job I enjoy the most is introducing students to the excitement and frustration of designing and building solutions to real problems. It is where students realize that engineering is more than math and physics and where they start to see how they might fit into the profession." "One of my proudest moments was May 2014 convocation. Drs. Wendy Krkosek, Sarah Jane Payne and Safiur Rahman all received their PhDs at the same convocation. Similar to previous graduate students from our lab, convocation is a very special time for the student and our lab. This particular convocation reminded me of how important family is to many of our graduates. Dr. Rahman’s daughter joined us on stage, which was very special, Dr. Krkosek’s and Dr. Payne’s parents came from Ontario and provided emotional best wishes to their daughters. However I was amazed how each family shared with me their detailed accounts of being a part of the Dal family and how much their loved one enjoyed being in our lab. It was a moment of great pride for the families and for me. Through that experience (and similar ones), I have realized how fortunate I am as a Professor to work with brilliant students that are professionally motivated to achieve sound engineering solutions and are personally motivated to keep their families best interest at heart." "I came to Dalhousie in 2001 and instantly felt like a valued contributor. The university was very welcoming. I also quickly learned that we have state-of-the-art equipment to work with, plus, we have exceptional researchers and students that we can rely on to see the work through. We are fortunate at Dalhousie; because we are a small community, it is easier for people to access the facilities and research expertise. The research environment here at Dalhousie is definitely a friendly and accessible one. I think that sets us apart and is a fantastic trait to have. Another highlight of my career is getting to know the students and watching them mature into engineers over their time here. It’s really great to get to see them flourish." 1. How long have you been at Dalhousie? "Escaped hurricane Katrina en route to Halifax in 2005 with my wife Dr. Susanne Craig (Research Associate, Department of Oceanography)." 2. How has the university changed since you started? "Sexton campus appears to be better integrated into Dal as a whole." 3. How have you changed since your started? "I have become a better scientist for being surrounded by engineers." 4. What was your first job at Dal? "It was senior research scientist within the Department of Community Health and Epidemiology, Medical Faculty. Prior to moving to Canada in 2006 I was an Assistant Professor within the Department of Civil and Environmental Engineering at the University of Strathclyde, Glasgow, Scotland. It was strange working in a Hospital environment after working in an engineering department for 16 years." 5. Tell me about a time you were proud to work at Dal? "When I found out I received an NSERC Discovery Grant after 6 prior attempts." 6. What do you love about Dal? "I love being able to bike or walk to work. And I love the diversity of the student body and Faculty." "I was a member of the last graduating class (Mech '97) of the Technical University of Nova Scotia, and left TUNS to work as an engineer in the private sector. After four years I returned to what had become the Dalhousie Faculty of Engineering and earned my M.A.Sc (Ind '03). I once again returned to working in industry, but throughout all of those experiences, I continued to feel that there was the potential in Nova Scotia for stronger connections between the worlds of academia and industry. It was impossible, then, to say no to the opportunity to work as an Engineer in Residence here in the Faculty. I love this role because I get to work directly with students, mentoring them through their capstone projects (senior design projects, which give students an 8-month, real-world project in industry). I also work directly with industry partners by connecting companies with the capstone program or with other students and researchers in the faculty who can provide academic support to their operations. I believe the Faculty of Engineering has an immense body of knowledge and skills to offer local industry. By strengthening our partnerships with them, we work towards a stronger Nova Scotian economy and we graduate students with skills and experience that will lead them to success in the world outside the academic setting." "I started working at Dal in 1999 as a postdoc and part of my job involved helping with fieldwork on Sable Island. Working on Sable turned out to be a life-changing experience, partly because it really is a magical place but it’s also where I fell in love with my husband and research. In 2004, I started my position as professor at Dal. While I don’t go to Sable very often any more, I still enjoy working at Dal because every day involves different challenges. Some days, my focus is entirely on teaching. On others, I’ll spend time working with students or repairing equipment. Often, the best days are the ones that I can devote to research. My group works with marine lipids, looking at degradation of omega-3 fish oils (the kind you buy in grocery stores) and the transfer of essential fatty acids through food webs. I love this work because it’s all about problem-solving and finding answers to interesting questions. When I was a kid, I wanted to be a scientist and this was exactly what I imagined myself doing. What could be better than that?" "After completing my Masters and PhD at Concordia University, I worked as a NSERC postdoctoral fellow at Université de Sherbrooke and as a Research Scientist at École Polytechnique in Montreal. I have always believed in working across disciplines and was rewarded after my Masters degree with a job offer from CAE (Canadian Aviation Electronics) in Montreal to work as a simulation specialist for modeling flight simulators and nuclear power plant systems. By this time, I had completed most of my course work for my PhD and decided to continue with my doctoral studies. I moved to TUNS (Technical University of Nova Scotia) as an associate professor in 1987. This provided me with an opportunity to build a new computational hydraulics laboratory, along with renovating the experimental hydraulics laboratory. In 1997, as part of the merger between Dalhousie and TUNS, we became part of Dalhousie University. Along with my teaching and research duties, I have always been involved with service to my Department, Faculty and University in various capacities. I am a firm believer in a student-centered university and am especially proud of my service as assistant dean of student affairs. In 2002 I was awarded the Rosemary Gill Award for outstanding service to students. I served as associate dean of graduate studies and research during 2003 – 2009 and was involved with introducing new interdisciplinary programs and liaising with industry and government agencies." "I graduated from Dalhousie in 2013 with a degree in Environmental Engineering and moved to Ottawa to work with my former co-op employer, WESA (an Environmental Consulting Company). I soon realized that I missed academia and after speaking to one of my professors from my final year of undergraduate studies, realized I could work towards my ultimate career goal of bridging the gap between science and policy through research at Dalhousie. I joined Dr. Wendy Gentleman’s research team and am now pursuing a PhD in marine ecosystem modeling and using my results to provide advice on sustainable fishing." "When I joined Dalhousie's Engineering Mathematics Department in 2002, I knew I had found a position that perfectly fit my vocation. My research expertise is in modeling marine ecosystems for fisheries and climate change applications, and being here affords phenomenal opportunities to interact with Dalhousie's world-leading programs in Ocean Science as well as Fisheries and Oceans Canada. My teaching of core engineering undergraduate math courses and graduate marine modeling courses means I can provide practical training to hundreds of students across the university. In these classes, I strive to make math concepts accessible and give students the motivation and confidence to learn by showing them how the material is relevant to what they want to do. One of the most rewarding aspects of my job is seeing those light bulbs of understanding turn on, and sharing their excitement about using their new quantitative skills and knowledge. I also get fulfillment from my engineering outreach activities. These include advising the Women in Engineering Society, where I participate in their Go Eng Girls recruitment event and educate modern engineering students about why the 1989 Montreal Massacre matters to them. Additionally, through my membership on the board of SuperNova at Dalhousie I get to engage with Atlantic Canadian youth in fun, hands-on experiences in science, engineering, technology and mathematics (STEM). Many members of the Dal community have become my extended family and my own children have benefited greatly from our connection to Dal." "With no specific career goal in mind, choosing a program and university out of high school is tough. Fortunately for me, growing up in Halifax I had many friends already at Dalhousie – specifically in engineering – who strongly recommended the program for me, knowing my love of math and problem solving. Not knowing what engineering could do for me or where it would leave me after graduation, I dove in and it turned out to be the best decision I’ve ever made. Five years later I have gained many new life-long friends, an iron ring, a degree in Mechanical Engineering, and it hasn’t stopped there. Thanks to my third-year numerical methods professor, Dr. Wendy Gentleman, I had been introduced to a completely new side of research: combining mathematics and modelling with oceanographic data. After completing a co-op term under Dr. Gentleman’s supervision, I became fascinated with mixing the two subject areas. I have now been given the opportunity to pursue a Master’s degree, developing models to represent zooplankton mortality and production to better understand their ecological roles in marine ecosystems. Needless to say, I am very excited to see what the next two (or more) years at Dalhousie has to offer." "Since I can remember, I wanted to be an Engineer. I have always wanted to know how things work. Originally I wanted to work in Aerospace, but as I grew older my interest in medicine developed, which ultimately led me into Biomedical Engineering. In 1999, Dalhousie established a new School of Biomedical Engineering and I was hired as one of three new faculty members in the School. As a young Professor in a new and emerging program, I enjoyed being able to help define the Biomedical Engineering program while at the same time establishing my own research in developing methods to regenerate tissues to replace parts of the human body. Over the years I have been privileged to teach and guide students at both the undergraduate and graduate level and see them develop and excel. What I find most satisfying as a Professor is having former students contact or visit me years after graduating and telling me about their successes and how their time with me at Dal prepared them for, and even influenced, their career path. In the same way, my research in Biomedical Engineering is focused on developing new and improved ways to help doctors treat their patients. My greatest reward is when I am able to see doctors using my research to treat a patient. It is these experiences as a Professor and Researcher that motivate me and why I enjoy working at Dal."